Barcelona council has a clear strategy for the electrification of their municipal fleet and public buses service. The implementation of electric buses is one of the actions proposed in the energy plan (PECQ), the air quality plan (PMQAB) and the mobility plan (PMU) of Barcelona. The goal of TMB (Transports Metropolitans de Barcelona), the company in charge of public transport in Barcelona, is to commit the electrification of its public bus fleet by next years. In 2013, the first electric bus was incorporated. It is a standard bus measuring 12 meters and has the capacity for 75 passengers. It is a last generation bus, model BYD K9, with two electric motors of 90 kW powered by a lithium-ion battery of 324 kWh. The bus can be charged in 5 hours and have 250 km of autonomy, enough for a whole workday. Under the ZeUS project , a European project with the aim to promote the implementation of electric buses, Barcelona is adding four new electric buses in its fleet. Two are 12m full electric buses supplied by IRIZAR and have a battery capacity of 352kWh and a range of 200-250km, with a charging time of six hours in the depot (slow charging during night). The other two are 18m buses supplied by SOLARIS and will utilize fast charging at bus terminals and slow charging at bus depots. TMB is monitoring the performance of the buses in order to evaluate the true operation, maintenance and infrastructure costs; as well as the reliability of the components and the environmental and economic gains of electric buses in Barcelona. 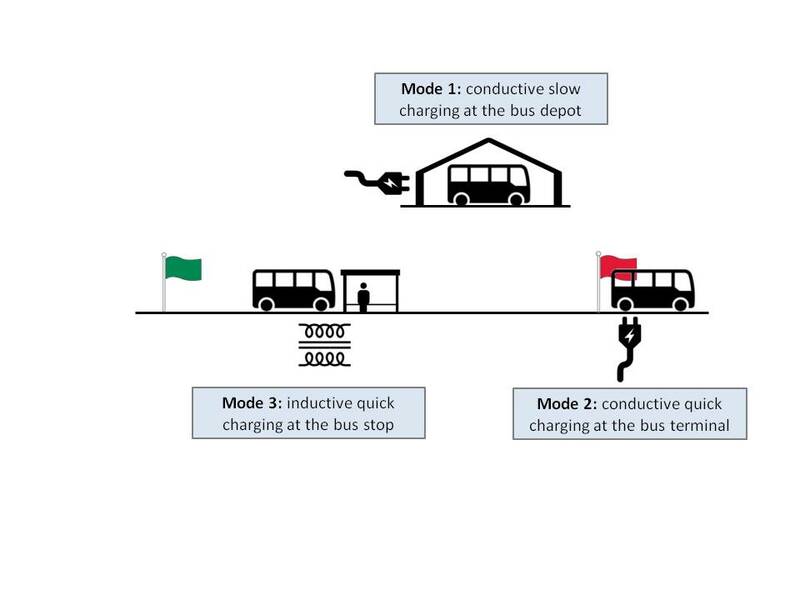 The battery charging strategy of the electric buses is essential in order to optimize the implementation and operation of an electric bus system in Barcelona. A common problem associated with electric buses, they require high capacity batteries to store enough energy for the whole day. These batteries are excessively heavy, thus increasing the bus energy consumption and reducing their autonomy. Through using a smarter charging strategy, of a quicker and more consistent charge, buses are enabled to be equipped with smaller batteries that weigh less, which reduces their investment cost and improving their overall performance substantially. The charging strategy will also take in consideration the hour to hour electricity price, as well as the contribution of renewable energy sources into the electrical mix, which reduces the operation costs and increase the sustainability of the bus network. In addition the bus charging can take advantage by using photovoltaic panels installed in the bus terminal (self-consumption). Finally we will explore the possibility of partial charges by inductive charging at the actual bus stop, as well within the actual bus lane on the concrete. The energy transfer system for electric vehicle induction operates through magnetic resonance. It consists of a primary coil on the actual road, which is connected to the electric grid and a pickup coil mounted underneath the vehicle inducing the charge. The inductive charging will allow the charging of the battery in just a few minutes, extending the range of the electric bus and improving its efficiency. The battery management system (BSM) will consider the three charging options for different bus lines and typologies in order to optimize the efficiency and profitability of the bus network.